We all need a safety-net during hard times. Help from the state can make a big difference to poverty levels. We want an inclusive and responsive welfare and support system, which provides an adequate income for people as and when they need it and does not create barriers or disincentives to working for those who can. 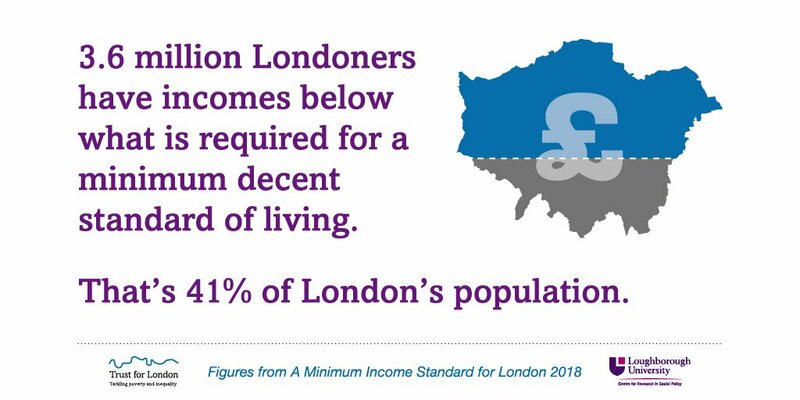 However, achieving decent living standards is a particular challenge in London as many costs are higher. Incomes need boosting, whether through wages or benefits, and costs must also come down. The impact of changes to the welfare support system, including caps, assessment, conditionality and sanctions. Improving the welfare support system, including in relation to areas where there may be less of a spotlight, such as the additional costs of disability, asylum support and local welfare assistance. Highlighting the effect on low-income Londoners of public services such as children’s centres and youth provision. Reducing the cost of living in London such as childcare and transport, as well as the disproportionately high cost of essentials for people on low incomes. Improving understanding of public attitudes on social security and challenging stigma attached to reliance on social security by working-age adults. This would include constructive ways to bring together people in receipt of benefits with policy-makers and practitioners e.g. Jobcentre Plus staff. The future role of social security and the state in preventing and tackling poverty and inequality in London. Casework and representation for appeals to the First Tier and Upper Tribunal. Strategic legal action including Third Party interventions and evidence-gathering for a potential legal challenge.